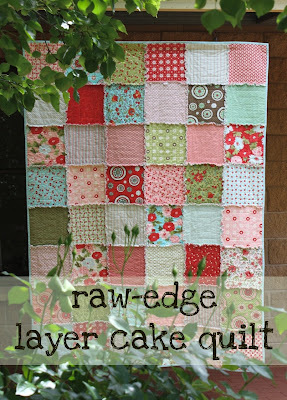 Thank you for your interest in my raw-edge layer cake quilt tutorial. The tutorial has moved and is available in its entirety at this link. Best wishes, Bloom. Love this! I especially like the clever quilting. I will have to try that on my next raw edge quilt. Thanks for a lovely tutorial to make a beautiful quilt. Grazie per il tutorial, spiegato molto bene con delle immagini ben chiare che aiutano a capire quello che con le parole non è di immediata comprensione. Thanks for the tutorial - this looks easy enough even for the likes of me!! Thanks Ros, love the quilt! Great quilting idea for the squares! Cute quilt! Thanks for the tutorial. I want to try this and have one question. When you say "...put wrong sides together...." do you mean the backing side? Take care. just wondering did you use flannel? Love your quilt and the design. I especially like the way you have quilted the design in the centre of each square. I will definitely be doing this on my next raw edge quilt, thank you so much. Thanks for the tutorial, your quilt is beautiful. I've been wanting to make a quilt like this. Thanks for a lovely tutorial to make a beautiful quilt. 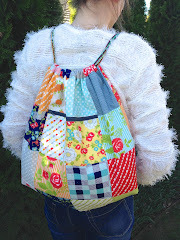 Great quilting idea for the squares! the space for a quilting frame this is and answer to a prayer. We will be making many of these for our missions group to take to KY.
Bloom: When sewing the rows together, do I press the seam allowances open or do I push them to one side? I tried to look closely at your pics but couldn't really tell. Hope to hear from you as soon as possible as I am putting my first raw edge quilt together as we speak. I'm so happy to find your blog! I can't wait to try this quilt. I won some Heather Ross fabric during a giveaway, and really had no idea what to do with it. I think I just found the perfect project! Thanks so much! Happy Sunday! Pam asked: "When sewing the rows together, do I press the seam allowances open or do I push them to one side"? Bloom says: On joining the rows, I opened the seams. But it really doesn't matter either way because the join is disguised under the fluffiness of the seam allowance and you don't really notice which way the seams are going. Hi "Bloom", I loved you tute and made a quilt for my new nephew, I am unsure how to send you a photo for your album. Thank you for your ideas, the use of the guides for quilting was great and very easy. I've linked back to this blog from my posts. I love this quilt and have seen several versions--but there is a thought that worries me about it and I'm hoping you can answer it for me. Does the fraying go down so far on your quilt after awhile that the seams are starting to open (I know this depends somewhat on the fabric type)? I can think of one way to stop it, but was curious about your experience with it. I made a quilt like this quite a while ago (here they are called "rag quilts")out of flannel. It is incredibly soft and has never frayed past the stitching, even with repeated washing! 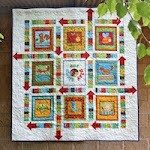 I just found your blog and I love this quilt. I have never quilted a thing but I want to. Thank you so much for this great tutorial; it has made me believe I just might be able to do it! I am going to get the fabric this week and give it a try. Wish me luck! So pretty! 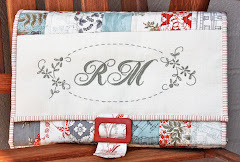 I have been planning on making a rag quilt just like this and a layer cake is a great idea. Just wondering if the raw edges fray past the stitching? How has it held up? That is the only thing holding me back...not sure if it will be a big mess of strings. I would love to hear how that worked out on yours. Thanks! I found you on pinterest...a board of beautiful quilts & bounced to your blog. I LOVE THIS! I am in the process of my first quilt. Im actually making 3 Christmas Tree Skirts using squares cut from my daughters baby clothes.. My squares are smaller but I am so adapting this style to my skirts! Your tutorial is awesome! Thank you so much for sharing your gift! So excited! I actually made one of these for my daughter. My sewing skills are not great, and I never thought I'd quilt anything. Thanks! I love the fabric you used. Was this from your fabric stash or was it a collection of fat quarters? I always use the same fabric hues and would love to do something different. These colors are so beautiful! Thanks for this tutorial! I made a quilt based on this (and then adapted it to my own). Love it! Love the colors in this quilt! What is the name of the layer cake fabrics you used to make this quilt? Saw a t shirt quilt, then the cake quilt....t-shirt cake quilt? I think so! Why waste all that great cotton material from the t-shirt backs. I'm so excited to try this. BTW...found you on pinterest as well...I am addicted. Your quilt design is my first attempt at sewing and quilting. It's so much fun. Quick question: since all seams are 0.5 inches throughout the quilt, shouldn't the binding be a 3" strip so you can have a .5 inch seam to sew to make the squares even on the binding edge? Love the project! Thank you. Thank you. Your quilt is very lovely. I started one a few years back made with flannel for the front and back it was a quilt intended for my father. Sadly he has passed and he never got to see it. I keep it wrapped up and put away. I will how ever try my hand at another on this time for everyone who sits and visits a spell to admire and use. So I made this and it turned out great! Heads up for those of you who hate doing bindings, if you just sew a half and inch in all the way around and snip the edges like the rest of the seams it turns out fine. Thanks for posting this - I was wondering about doing the exact same thing! Thanks for sharing your ideas...I have shared your tutorial on Freebies For Crafters. I was very keen to see the tutorial after seeing the real thing yesterday! The instuctions are very clear so I will be back. I appreciate the time and effort taken to publish them. Look forward to coming back!! on the market which will allow you to look great when you wear them. However, you need to be very careful in choosing your personal Cocktail Dresses because your handbag shows who you are, what your characteristics are, and many more. Therefore, you need to choose a omega watches online which will match to your lifestyle and your personality. In this article, you will learn some basic things that you need to consider when choosing the right discount gucci handbags for you. The post was professionally written and I feel like the author has extensive knowledge in this subject. Great post about this. I am sure many visitors will find this very useful. I made several quilts like this a few years ago and I just love them. They were so easy to make and they were just great. I taught a few friends how to make them. These were the easiest quilts I have ever made. Thanks for the inspiration, I have just completed my first quilt using your template idea, delighted! Will this pattern work with regular cotton fabric or a combination of the two? I can't seem to find much by way of flannel. I've been making these for several years and find sewing an X through each sandwich is quick and easy way to do the quilting.. With a reasonably good eye you don't even have to draw lines. I also don't use batting anymore- I use top and bottom flannel and it comes out thick and warm enough, unless you are in VERY cold climate. Use spring loaded snips to cut the fringe because it's easier on the hands. I am the above and want to add that flannel fringes best and also homespun. Can you use any kind of material. What do you think works best. is there a reason you couldn't sandwich a piece of flannel the same size as your bottom and top layers? would sewing 6 layers be too much to sew through when putting the blocks together? I would like to learn more about clipping on these rag quilts. I am new at all this and have been told clipping of corners is very important but not seeing anything on any of the patterns on this. I realize you need to clip all sides for the fraying, but is their a special way to clip the corners? I'm at the point of the batting is pressed in between the squares and I'm quilting them together. My question is...is it normal for the square to feel stiff after pressing them with the fusible batting? Will it soften once washed? A friend once asked me which I could give up more easily, gardening or stitching. An impossible question. Of course, the suggestion that I could give up either is preposterous! If you are similarly enamoured with blooms, whether they be real or stitched, welcome to my blog! Prom Hair Tutorial, Dress and Shoes! Sorry, No Podcast this Week! New at Hawthorne Supply Co.! Kaum ist ein Jahr vergangen – und schon gibt es ein neues Aurelia-Buch! LULUBLOOM: And now, she quilts. Scrappy Project Planner for Sewing! Printable 2016 Summer Olympic Bingo! Thank you Andrea and Merry Christmas to all! Don't Forget! I've moved to a new location! Ambleside and Beach House from Moda's New Designers! Velkommen til inspirasjonskveld og STORT SALG 21.januar! New website, new Blog, and Newsletter! back to my beloved sewing machine! I haven't gone mad. I KNOW Christmas is over! End of an Era and Moving details!! There Are a Million Ways to Say Thank You! This is a Flickr badge showing public photos from Bloom and Blossom. Make your own badge here.